To meet increasing demand, Wattle Park Teachers College branched off from Adelaide Teachers College in 1957, followed in 1962 by Western Teachers College. Further teachers colleges were established in 1966 (Bedford Park Teachers College) and 1968 (Salisbury Teachers College). Bedford Park Teachers College was originally located partly within Flinders University's School of Social Sciences, and partly within a Sturt Road annex. At the end of 1967, the college moved to its own buildings in Bedford Park, adjacent to the university. In 1973, Bedford Park Teachers College became Sturt College of Advanced Education. Salisbury Teachers College was initially temporarily located within buildings of the Adelaide Teachers College, at Kintore Avenue, Adelaide. From mid-1969, the college was located in its new buildings at Smith Road, Salisbury East. In 1973, Salisbury Teachers College became Salisbury College of Advanced Education. Adelaide Teachers College was located at Kintore Avenue, Adelaide. In 1973, Adelaide Teachers College became Adelaide College of Advanced Education. Wattle Park Teachers College was located on Kensington Road, Wattle Park. In 1973, Wattle Park Teachers College became Murray Park College of Advanced Education. At that time, the college relocated to St Bernard's Road, Magill. Western Teachers College was originally located in Adelaide (Currie Street) and Thebarton (South Road), which until 1962 were annexes of the Adelaide Teachers College. In 1973, Western Teachers College merged with the South Australian School of Art to become Torrens College of Advanced Education. 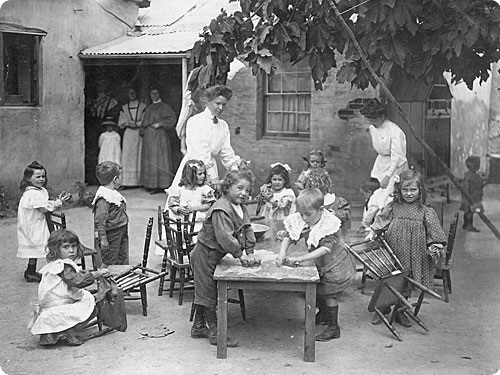 The Kindergarten Training College was established in Adelaide in 1907, operating in various locations. It subsequently moved to North Adelaide - first to Palmer Place in 1915, then to Childers Street in 1961. From 1967, the college was known as Adelaide Kindergarten Teachers College. In 1974, Adelaide Kindergarten Teachers College became Kingston College of Advanced Education.